Beginning the year with a bow. The year 2013 is barely underway and I'm noticing that there are already so many opportunities to bow. To honor, acknowledge and appreciate the small miracles that are happening everywhere around me when I pay attention. Every type of human encounter can generate a bow, whether it's someone already in my heart or a stranger I've just let in. From the everyday joys and delights to the riddles and misfortunes. Let us bow. This past summer and fall I've been working on new writing and illustrations that will be published by Brush Dance as 2015 calendar products. Just finished all the new art in mid-December... about 20 new illustrations and 12 of them have been chosen for the calendar. The new Brush Dance title is Grateful Heart, Joyful Woman. I've been so excited about this new title! Gratitude is a topic that has inspired me over and over throughout my life, especially when I'm most out of touch and far removed from what is important. Forgetting to bow in gratitude, I become inflexible, unhealthy, stifled in my creativity, and then... just when I despair I've lost my way, I remember I need to begin to bow again and everything loosens up and begins to flow. And then I'm back, merrily and gently rowing, flowing and navigating in the stream of life. The illustration above (not in the calendar) was inspired by the art of bowing in many cultures. I've looked at the ways that people bow to each other, to life, to a deity, in reverence and appreciation. 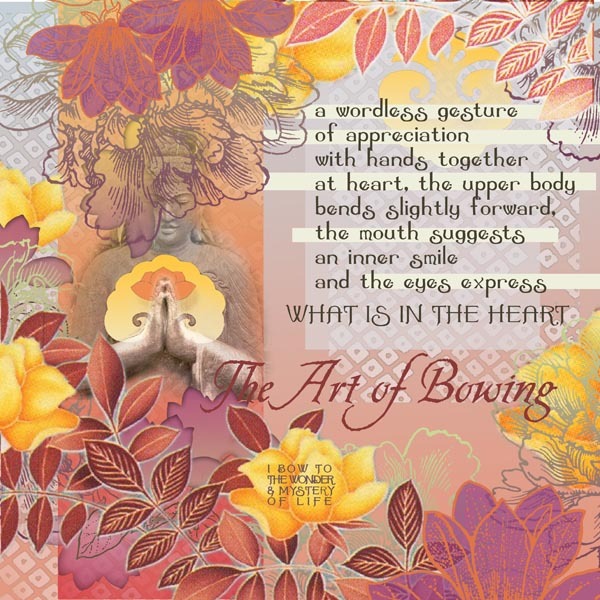 I learned to enjoy and embrace the art of bowing many years ago from my husband. His bowing is the most natural and humblest of gestures. He bows to all and bows often.